Prison and politics makes for strange bedfellows. I know what you’re thinking, more politicians should be in prison. I will not disagree with that notion, especially as we head into the election season. Pick your poison here, lying, backstabbing, socialist, fascist, egomaniac, there are politicians of every stripe to choose from. While I have my list of politicians I’d like to see in orange jumpsuits, the politics and prison I’m referring to here, are the influences that combine to direct prison operations, on the outside and on the inside. Anyone who has been around prisons and law enforcement knows the “tough on crime” pendulum swings from one extreme to the other, based upon who happens to be in office. A more liberal governor means the tough on crime net, gets a bit more porous and the net tightens when a conservative is at the reigns. The people on the inside are the ones who have to change the rigging on the prison ship to adjust to the new course. Politics, is about power and money. Simple as that. Who has it, who doesn’t, who gets it and who won’t. Prisons are big business. At over $60,000 per inmate per year, in California, a sizable chunk of the state budget goes to incarcerating felons. Years of tough on crime politics created a massive prison expansion program beginning in the 1980’s and the the convict population swelled from 30,000 to over 170,000 by 2010. The “build it and they shall come,” factor played a part, but local probation supervision options became less and less viable for effective public safety. Underfunded, understaffed, with caseloads of 200 or more, probation officers could do very little to change behavior, and there was no incentive for a county probation department to keep a felon on county supervision, when state prison was wide open. Statute changes increased the number of mandatory prison sentences and the construction boom couldn’t keep up with the population. Enter the private prison corporation. As prison populations exploded, a new market economy appeared. The inmate population become the new currency, with private prisons popping up, offering to do the same job for less money. States jumped at the opportunity to shed workload over to the privateers and save a buck or two in the process. Correctional Officer Unions made compelling arguments that the private staff weren’t trained to handle the population, and had little experience with inmate management. The private prisons settled on housing the lower risk inmate population. The privates flourished, even transferring prisoners out of state to serve their prison terms. Cue, the pendulum. In California, a successful voter ballot initiative and a statutory change (AB 109 and Prop 47) reclassified a number of crimes in what was called “realignment,” Offenders who would have served their terms in state prison now stay in county jail, for years. In very simplistic terms, prison beds are reserved for the most violent and recalcitrant felons. What that means, at the prison level, is that after the private prisons cull off the lower risk population, and the non-violent inmates stay at the county level, what’s left is a petri dish of unrest. The most violent, the staff assaultive, the highest escape risk, the mentally ill, and prisoners with long sentences have nothing to lose by challenging and attacking staff. Correctional staff are faced with federal oversight and guidelines developed by people who have never stepped inside a prison. Politics. Political decisions on segregated housing, use of force policies and cell assignments and a laundry list of restrictions impact staff and inmate safety. Staff are assaulted, murdered and are often blamed for inmate violent behavior. Outside political influence will shift the blame to staff and poor policies when their pressure to reduce overtime spending, or cut staffing levels, had more to do with the outcome. When will inmates be held accountable for their behavior? Violent inmates do violent things and a politically driven policy will get staff and inmates killed. Release inmates from a Security Housing Unit, before they no longer pose a threat, and people die. The public doesn’t see what happens behind the walls. They don’t want to see. Take bad people away and let me go on with my own life. These bad people, continue to commit crimes in prison. The job of correctional staff has become harder and more dangerous. Politicians are the least qualified people to deal with these threats to public safety, when their primary motivation is the bottom line on a budget. Part II of Politics and Prison will cover political influences inside the convict world or prison gangs and Security Housing Units. Great post, James. I worked with kids in the foster care system whose parents and grandparents were in jail – drugs, prostitution and resulting poor behaviors – I can remember them being drug into dependency court where their kids would get to see them in leg-irons. Didn’t do much for the kid’s self-confidence. That has to change I think. Look forward to Part 2! My husband has worked 25 years as a CO. Addiction and mental illness by far make up the majority of reasons for incarceration. Prison is no place for these people and only creates a revolving door program as the real issues are never addressed. The safety net for the mentally ill and addicted is woefully inadequate. I have had inmates tell me they committed a new crime to come back to prison so they could get the treatment they needed. That is something that really needs to be changed or that revolving door will keep spinning. Thanks! I’m sorry, but I got lost on the $47,000.00 per person. Must speak to the husband as he does not spend anywhere near that much on me! To be serious, politics seldom runs anything efficiently. I’m sorry I used an old figure…the cost now is upwards of $60,000. And your husband has some explaining to do. Excellent post! I have always seen privatized prisons as a conflict of interest. It’s my understanding that when contracting with these companies, the government agrees to send at least a minimum number of prisoners there. In other words, the government is obligated to have a constant flow of criminals to feed to the prison industry. Prison should not be an industry, and the goal of the government should be to have fewer criminals rather than to meet a criminal quota. Looking forward to your next installment. Thanks so much, Piper. I’ve seen some contracts with private prison that set a minimum reimbursement level, regardless of the number of prisoners served. 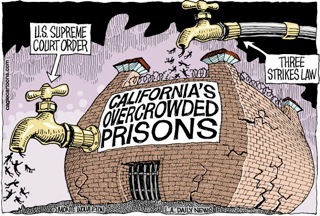 As Population Manager for California, I had to siphon off inmates from the reception centers to fill those beds first. I totally agree that instead of business as usual, we need to look to ways of crime and harm reduction. Thanks again, Piper! ← You Want Me To Pin What?